On April 12, 1859, a certain mysterious C. Winter, of Piqua, county of Miami and State of Ohio, received a 3-pages USA patent №23637 for Improved Adding-Machine (a single column adding device), which seems to be the fourth in the USA keyboard adder, after the machines of Parmelee, Castle and Nutz, and seventh in the world, after the machines of White, Torchi and Schwilgué (see the first page of Winter's patent below). 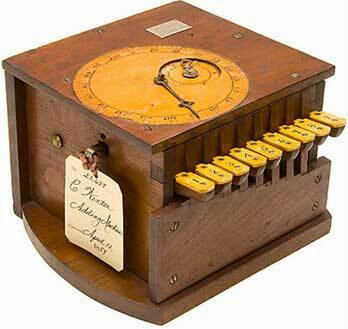 What makes this machine a remarkable one is the fact, that its constructor is most probably a woman, thus this machine is the first and the only mechanical calculator, devised by a woman, namely Caroline Winter. Almost nothing is known about the inventor—Caroline Winter, a daughter of John Winter. She was mentioned in the business directories for Piqua in 1859-60 and 1860-61 as a general store owner in Piqua. She died on November 6, 1875. Obviously Caroline Winter devised this machine to facilitate the tedious calculations in her store and trade business, as it is said in the patent "It will be perceived that by the use of this machine figures may be added rapidly and always with perfect correctness." Interestingly enough, the witnesses of her patent—Augustin (or Augustus) Thoma (1819-1900) and John B. (Baptiste) Larger must had been also interested in this machine. Mr. Larger was a wealthy Piqua merchant, who unfortunately was killed young in 1862 in a Civil War battle. Mr. Thoma was the founder of a successful jeweller's business in Piqua, which was conducted by his descendants and survived up to 2010. Moreover, Augustin Thoma was not only a jeweler and merchant, but also a skilful instrument maker and watchmaker. He is a holder of 3 US patents—for a Jewelers Tool (pat. №67462 from 1867-08-06), for a Watch Jeweling Tool (№70049 from 1867-10-22) and for a Watch Maker Tool (№120618 from 1871-11-07), so we could easily imagine, that he was somehow involved in the construction of the Winter's machine also. In contrast of the first US keyboard calculating machines however (these of Parmelee and Castle), the machine of Caroline Winter did survive to the present, in the form of the Original U.S. Patent Model (up to 1880, the Patent Office required inventors to submit a model with their patent application). In early 2000s the device was a property of Auction Team Breker, Koeln, Germany (see the photos below) and was sold in an auction in 2009 for $46480 to a specialized European museum (I guess Auction Team Breker could eventually get a much better price, if they knew my assumption that this is the only mechanical calculator, devised by a woman:-). The size of the machine is 27 x 22 x 25 cm. 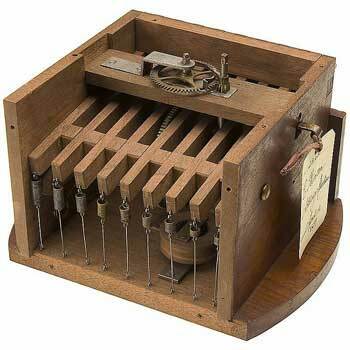 The box is made from oak, with ivory key taps and two dial faces on top of registers. 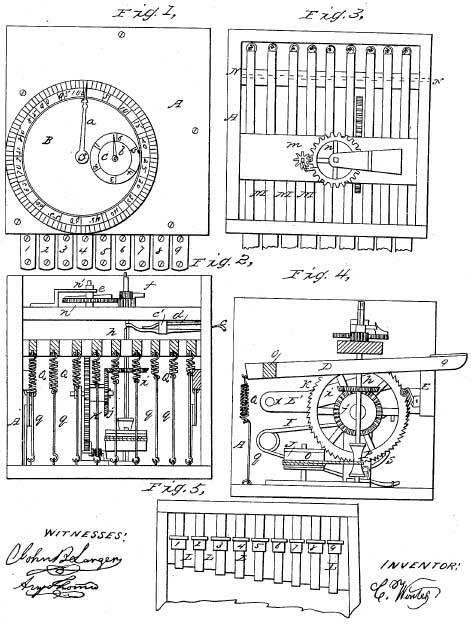 The base part of the internal calculating mechanism is the ratchet-wheel (marked with K on the patent drawing), which is provided with 100 teeth, bevel-wheels j and i, pawls s and z, cord o, and pulley P. The big dial B is divided to 100 divisions, while the smaller dial C is divided to 6 divisions, thus the calculating capacity of the machine is up to 699.